There is a good reason for hope, for those who look for a happy ending to the revolution of population genomics that is quickly turning into an involution led by beliefs and personal interests. This blog is apparently one of the the most read sites on Indo-European peoples, if not the most read one, and now on Uralic peoples, too. I’ve been checking the analytics of our sites, and judging by the numbers of the English blog, Indo-European.eu (without the other languages) is quickly turning into the most visited one from Academia Prisca‘s sites on Indo-European languages, beyond Indo-European.info (and its parent sites in other languages), which host many popular files for download. If we take into account file downloads (like images or PDFs), and not only what Google Analytics can record, Indo-European.eu has not more users than all other websites of Academia Prisca, but at this pace it will soon reach half the total visits, possibly before the end of 2019. 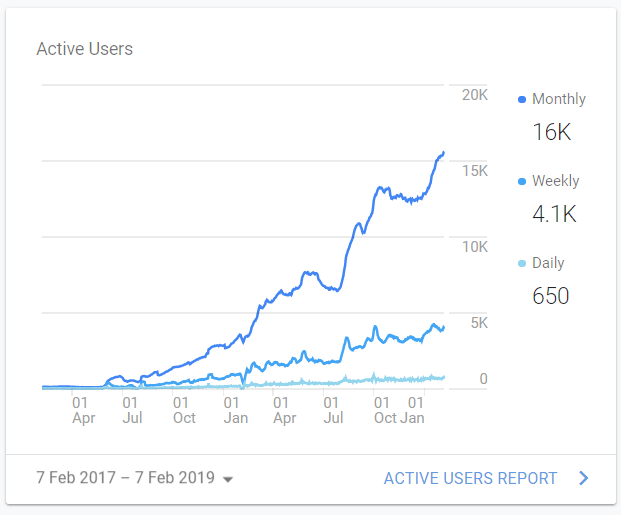 Overall, we have evolved from some 10,000 users/year in 2006 to ~300,000 active users/year and >1,000,000 page+file views/year in 2018 (impossible to say exactly without spending too much time on this task). Nothing out of the ordinary, I guess, and obviously numbers are not a quality index, but rather a hint at increasing popularity of the subject and of our work. NOTE. The mean reading time is ~2:40 m, which I guess fits the length of most posts, and most visitors read a mean of ~2+ pages before leaving, with increasing reader fidelity over time. Number of active users of indo-european.eu, according to Google Analytics since before the start of the new blog. 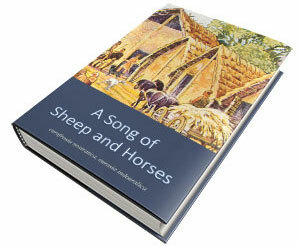 Notice the peaks corresponding to the posts below (except the last one, corresponding to the publication of A Song of Sheep and Horses). NOTE. Of course, the most recent posts are the most visited ones right now, but that’s because of the constant increase in the number of visitors. The most likely reason for the radical increase in this blog’s readership is very simple, then: people want to know what is really happening with the research on ancestral Indo-Europeans and Uralians, and other blogs and forums are not keeping up with that demand, being content with repeating the same ideas again and again (R1a-CWC-IE, R1b-BBC-Vasconic, and N-Comb Ware-Uralic), despite the growing contradictions. As you can imagine, once you have seen the Yamna -> Bell Beaker migration model of North-West Indo-European, with Corded Ware obviously representing Uralic, you can’t unsee it. The online bullying, personal attacks, and similar childish attempts to silence those who want to talk about this theory elsewhere (while fringe theories like R1a/CHG-OIT, R1b-Vasconic, or the Anatolian/Armenian-CHG hypotheses, to name just a few, are openly discussed) has had, as could be expected, the opposite effect to what was intended. I guess you can say this blog and our projects have profited from the first relevant Streisand effect of population genomics, big time. If this trend continues this year (and other bloggers’ or forum users’ faith in miracles is not likely to change), I suppose that after the Yamna Hungary samples are published (with the expected results) this blog is going to be the most read in 2020 by a great margin… I can only infer that this tension is also helping raise the interest in (and politicization of) the question, hence probably the overall number of active users and their participation in other blogs and forums is going to increase everywhere in 2019, too, as this debate becomes more and more heated. Are you not entertained?! Are you not entertained?! Is this not why you are here?! 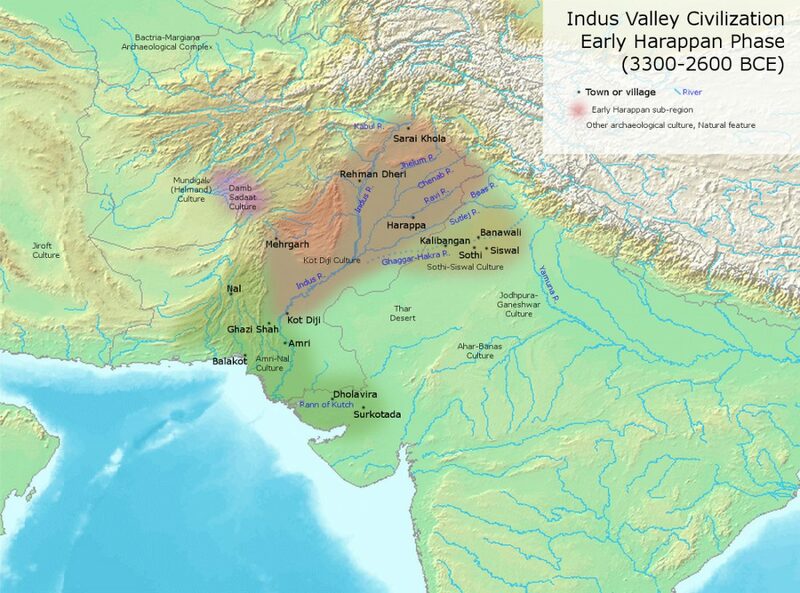 Razib Khan reports on his new website about an article by Tony Joseph, Who built the Indus Valley civilisation?, itself referring to the potential upcoming results of a genetic analysis project involving Rakhigarhi, the biggest Harappan site. The possible scenarios based on potential sample results in terms of Y-DNA and mtDNA haplogroups seem to be generally well described, and I would bet – like Khan – for some kind of an East-West Eurasian connection. This is all pure speculation, though, and after all we only have to wait one month and see. In the ancient DNA from Rakhigarhi, scientists identify R1a, one of the hundreds of Y-DNA haplogroups (or male lineages that are passed on from fathers to sons). They also identify H2b — one of the hundreds of mt-DNA haplogroups (or female lineages that are passed on from mothers to daughters) — that has often been found in proximity to R1a. There is no reason whatsoever to think that this would be the research finding, but if it is, it would cause a global convulsion in the fields of population genetics, history and linguistics. It would also cause great cheer among the advocates of the theory that says that the Indus Valley civilisation was Vedic Aryan. And it goes on to postulate reasons why such a big fuss will be created about the potential finding of haplogroup R1a, and its implications for the Out-of-India Theory. A global convulsion, no less. But, since when do genetic findings cause revolutions in Linguistics? Or even in Archaeology? When I thought the identification of R1a – Indo-European could never reach a lower level of unscientific nonsense, based on circular reasoning, here it is, a worse example. Not only are there people waiting desperately to see just one sample of an R1a subclade in Yamna to oversimplistically identify (yet again) Corded Ware with the Indo-European expansion; there are also people waiting to find just one sample in India or Central Asia to destroy the current models of steppe origins for Proto-Indo-European. 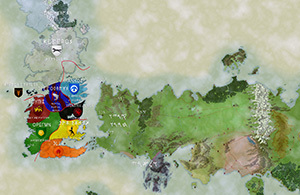 I guess this childish game is more or less based on the same premises that made some people believe that the concept of the ‘Yamnaya component’ destroyed traditional archaeological models. 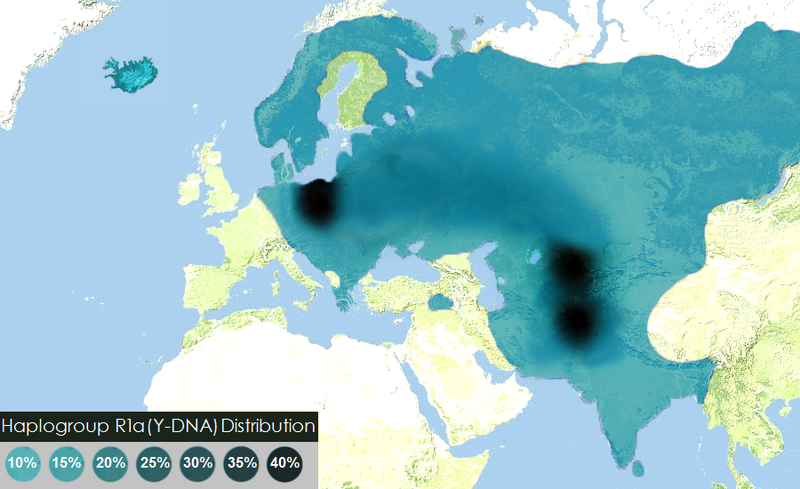 Modern haplogroup R1a distribution from The Genetic Atlas (PD), the kind of simplistic maps that generated the current misconceptions (or how to sow the wind among populations with an inferiority complex). 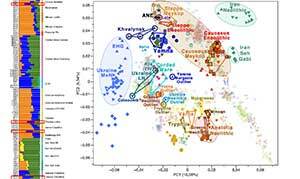 It seems that all new methods involving admixture analysis, PCA, and other statistical tools to study Human Ancestry are still irrelevant for most, and indeed that Archaeology and even Linguistics are at the service of the simplistic identification of ancient languages with modern haplogroup distributions. We are reliving the 1990s in Genetics, and the 1930s in Archaeology and Linguistics all over again. This must be great news for companies that offer genetic analyses… I wonder if it is also good for Science, though. The funny thing is, the same people responsible for the survival of these misconceptions, i.e. R1a – Indo-European fanboys, who constantly fan the flames of absurd genetic-genealogical and ethnolinguistic identification, are often the first to criticize models compatible with the Out-of-India Theory. I really hope some R1a subclade is found among the samples, so that stupidity can reach the lowest possible level in discussions among amateur geneticists obsessed with haplogroup R1a’s role in the expansion of Indo-European speakers. Maybe then will the rest of us be able to overcome this renewed moronic supremacist trends hidden behind supposedly objective migration models. For those interested in actual Indo-European migration models, the finding of early R1a subclades in central Asia (or India) – like the potential finding of R1a subclades in Yamna – does change neither Archaeology nor Linguistics on the Indo-European question. Genomics is merely helping these disciplines evolve, by supporting certain archaeological models of migration over others, but no revolution has been seen yet, and none is expected. Each new genetic paper helps support the strongest archaeological models of steppe origins for Proto-Indo-European, and a Late Indo-European expansion compatible with current Linguistic reconstructions. 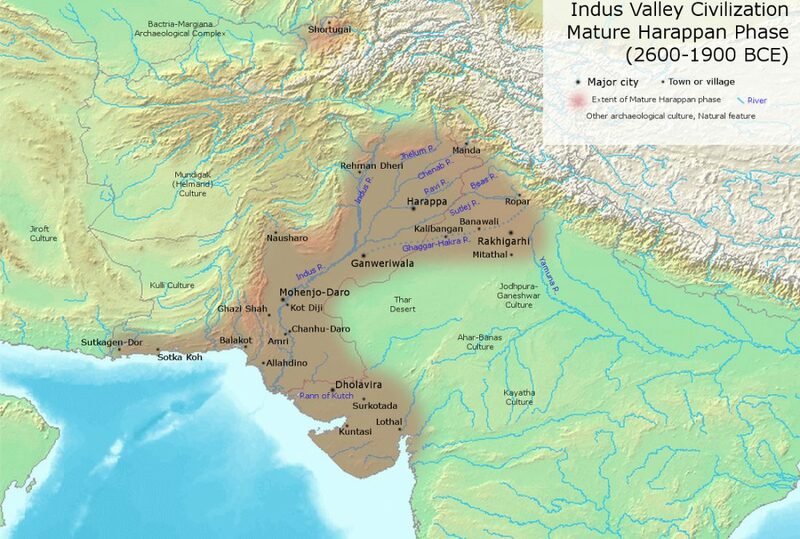 Featured image: From Wikipedia, Indus Valley Civilization, Mature Phase (2600-1900 BCE), by Jane McIntosh. 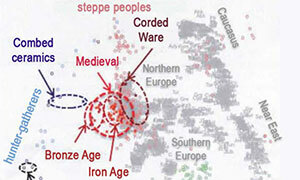 Not long ago, the Proto-Indo-European language Urheimat problem used to be cyclic in nature: linguistic and archaeological publications appeared supporting a Copper Age migration from the steppe proposed by Marija Gimbutas, or a Neolithic expansion from Anatolia (or Armenia) proposed by Colin Renfrew, and back again. I have always supported the simpler, more recent Chalcolithic migration of Late Indo-Europeans from the Pontic-Caspian steppe over an older Neolithic expansion from Anatolia with agriculture. The latter model implied a complex cultural diffusion over a greater span of time than is warranted by linguistic guesstimates, understood as the general grasp that anyone can have on how much a language changes in time, comparing the different stages of different Indo-European languages. Whether they like to talk about it or not, or whether they would describe them as such (or else as terminus ante or post quem), most known linguists and archaeologists involved in Indo-European studies have published at some point their own guesstimates. To have an idea about how guesstimates work, you only have to learn some Indo-European languages from different branches, the ancient languages from which they are derived, how they have evolved from them through time, and their proto-languages, to see how unlikely it is that the differences from Late Indo-European to Proto-Greek, Proto-Indo-Iranian, Proto-Celtic, or Proto-Italic need a leap of ca. 3000 years almost without change, as required by the Anatolian hypothesis. Some have strong reactions against guesstimates arguing you cannot compare historic or proto-historic changes to prehistoric ones, to support a different linguistic change rate from Proto-Indo-European to proto-languages. I find this to be a sound criticism, but often used justify a worse, ad-hoc estimate that supports other theory. Glottochronology – in case you are looking for mathematics or statistics to solve the problem – is as useless today as it always was. Not everything – in fact few things in anthropology – can be solved with algorithms and statistics. I do love algorithms and statistics, because their results – if based on sound assumptions – are hard to be contested, but not a single good one has been proposed for comparative grammar, as far as I know. 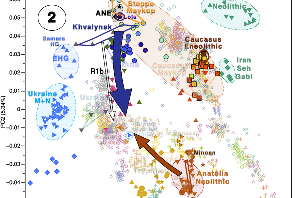 The steppe hypothesis was always the simpler connection with modern Indo-European languages, from a linguistic and archaeological point of view, and archaeogenetics (since the advent of haplogroup investigation, and the finding of modern R1a distribution) did also support it. However, it implied a conquest by warring patrilocal peoples, that substituted the ‘original’ Neolithic European and Asian population and languages, and invasions have not been a fashionable antrhopological subject for a long time. One of the consequences of the genocidal racism and xenophobia seen during World War II was the strong reaction to its ideological foundations, and there was a common will to end with Kosinna’s trend of historic ethnolinguistic identification of modern peoples. Linguistics and archaeology did then search for more complex models of human relations and exchange, mostly to avoid what appeared as simplistic concepts of migration or invasion. Marija Gimbutas’ simplistic kurganist, male-driven invasion of territories inhabited by matrilocal Old Europeans, albeit reasonable, did not fit well with these post-war times. One could accept historic and proto-historic atrocities and genocide by any people against others, and even tribal conflicts between prehistoric hunter-gatherers that ended in the destruction of one of them, but a violent, massive spread of ‘Aryans’ was considered a dangerous idea to be avoided. 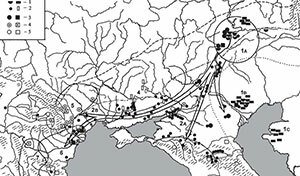 Thanks to the effort of David Anthony (among others) in supporting migration models in Archaeology, the steppe model did have a strong revival even before archaeogenetics began to be a thing in anthropological research. The Anatolian hypothesis, on the other hand, seemed like a fine, long evolution of a language accompanying the peaceful spread of a technological innovation, farming and cattle herding. Originally believed to be mostly a cultural diffusion (now it has been demonstrated to be a mixed diffusion event, with strong demic diffusion in its early phase), it was thus in line with a more politically correct view of prehistoric events. 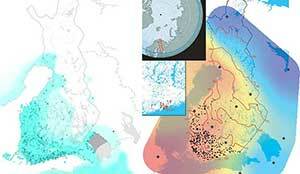 While recently there have been some doubts expressed by Mathieson et al. 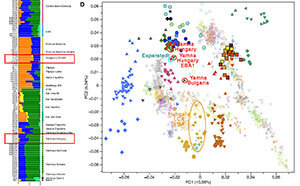 (2017) on the of the steppe hypothesis regarding Proto-Anatolian, it is likely that the lack of enough ancient DNA of the Balkans and Anatolia is the key factor here. An interesting linguistic proposal, the glottalic theory, while sound in its assumptions and results – much less likely in my opinion than the more common two-dorsal theory, and this much more likely than the prevalent three-dorsal one – gave some theoretical support to the Anatolian (or Armenian) hypothesis, since some proponents felt that a glottalic Proto-Indo-European should have an origin near to the Armenian homeland – because glottalic Proto-Armenian would have retained a phonetic state nearer to the “original” Proto-Indo-European. 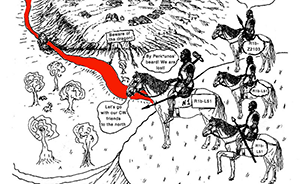 That simplistic regional continuity explanation is akin to the trend of Basque researchers to discover links of Proto-Basque with the Pyrenees in Mesolithic and Palaeolithic times, when there is no data to warrant such identifications – and it seems in fact that Proto-Basque, Proto-Iberian, and Palaeo-Sardinian might have accompanied the expansion of farming in the Neolithic. Probably most proponents left of the Glottalic theory today (like Frederik Kortlandt and Alan Bomhard) would accept a steppe migration unrelated to an Armenian or Anatolian origin. There were indeed other marginal proposals, with people supporting origins of Proto-Indo-European in both ends of the current distribution of Indo-European languages, from the “Indo-” in Out of India theories, to the “-European” in Eurocentric proposals. Most Eurocentric proposals – based on certain archaeological cultures and their evolution in- and outside Europe – have been dismissed with archaeological and genetic research, and the remaining ones usually favour the more fashionable peaceful spread of languages. A small group in support of the more recent Palaeolithic Continuity Theory remains. It seems to me as deeply flawed from a linguistic point of view (with a much larger time span needed than for a Neolithic expansion), but their arguments are led by research on genetics and archaeology, and not much is left for European romanticism, so it has always appeared to me as a professionally acceptable – although futile – attempt by eccentric researchers to disentangle prehistoric events. The Out of India theory is the name given to a group of (mostly) independent models that usually propose a Proto-Indo-European homeland based on or around India. Contrary to the PCT, an Out of India theory set during the Mesolithic or Neolithic would be feasible from a linguistic point of view: you could somehow connect some archaeological migrations to support the spread of Early-Proto-Indo-European-speaking R1a lineage happen east-to-west (and north), and genetically it had support in some papers on modern distribution of R1a subclades, for example in Underhill et al. (2014). 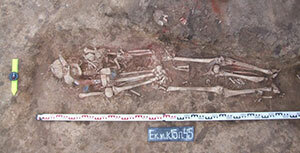 Underhill himself has since questioned his conclusion in view of recent papers publishing ancient DNA analysis. Out of India theories, overall, could thus be as strong (or as weak) as the theories concerning an Anatolian origin, in their potential for explanation of the ancient origin of the Proto-Indo-European language spoken in the steppe during the Neolithic and Chalcolithic. However feasible they might a priori be, I have yet to encounter a decent modern paper with that kind of proposal, based on recent genetic papers. Most modern articles are just Indian nationalist crap, and the only decent papers on this matter are becoming quite old fpr this relatively young field of Indo-European studies. Maybe that’s because I don’t have enough time to look for the hidden good anthropological papers among so much dirt. After all, it is not a very likely theory, and one has a limited amount of time. In recent papers, if you get rid of simplistic reactionary and revisionist views, conservative Indo-Aryan Hindu nationalist or religious bigotry, fantastic connections with the Indus Valley civilization, and simplistic identifications of Proto-Indo-European as ‘nearer’ to Vedic Sanskrit – with absurdly old and odd references to Schleicher’s reconstruction and dialectal Indo-Slavonic or Satem references -, you are left at best with some basic criticisms of Eurocentrism and the known shortcomings of anthropological disciplines in investigating Proto-Indo-European Urheimat, but no data to support any connection with India whatsoever. If there is a reason for a generalised inferiority complex in India, I would find it in the shameless publication and popularity of such worthless research papers, a trend that is also seen in scientific fields, with Indian researchers having a increasingly tougher time passing editorial and peer reviews, and resorting thus to national journals. 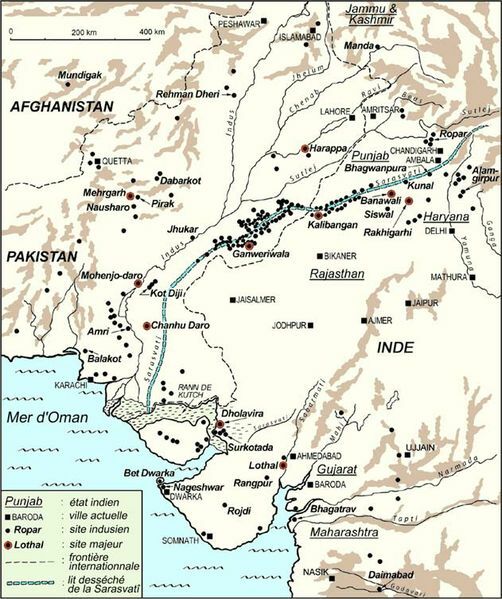 In the case of Indo-European studies, instead of trying to fit data with what we know, the only aim in Indian research seems to be to connect the Indus Valley with Proto-Indo-European, and Proto-Indo-European with a “pure” (i.e. Vedic) Indo-Aryan, to support a mythological Indo-Aryan Hinduist India. And that is mostly what you will find in any Out of India article today, whether based on linguistic, archaeological, or – what is prevalent today – genetic investigation. This has been The Out of India Controversy Week: it began last week with the publication of a quite decent article in The Hindu by Tony Joseph summing up the current situation of anthropological research. It was followed by reactions in conservative Indian news, and this in turn was contested by Davidsky and Razib Khan. The original article by Tony Joseph has been echoed by Victor Mair in Language Log, and I agree with his description of Joseph’s paper as “informed, sensitive, balanced, and nuanced. This is responsible science journalism”, even if I disagree with some of his statements (in a different way than Mr. Mair). However, this propaganda disguised as scientific criticism is what you get from Indian nationalists. EDIT (25/6/2017): Razib Khan has published a thorough post on Indian evolutionary genetics as follow-up to this week’s controversy. I think there is too much effort being invested during these controversies precisely by the people who need not explain themselves. Anyway, good summaries of anthropological matters are always welcome. EDIT (29/6/2017): Other posts on the subject, from Brown Pundits: On the “Aryan” debate – the linguistics POV; Razib Khan’s Indian genetics, part n of many; and Aryan Migration and its Discontents. Interestingly, any time new research comes to shake certain Indian nationalist foundations, a stronger backfire effect happens, and more criticism is done on the shortcomings of such anthropological research. Because, indeed, if the anthropological theory is flawed, mythical Indo-Aryans spread from the Indus Valley, right…? One can only expect this kind of controversies to escalate in conservative Indian blogs and fora alike, and then deescalate until the next paper is published. A dialectic cycle whose only evident result is the increased opposition that conservative Indian researchers – or researchers that depend on funding by such groups – will have in publishing anything related to a potential Aryan invasion, and the addition of a stronger bias in Indian research. This reaction, our history is great no matter what, seems to be a good one for research, since it allows for any change in our romantic views of the past. This, however, does not seem to be the case for some nations, and this inability to change their views is likely related to the inferiority complex that some nations have developed, in turn probably caused by western European colonialism, so one is left to wonder how responsible we are of modern chauvinist trends. Seeing how so many people of eastern European ancestry are convinced of an origin of R1a-M417 in Indo-European migrations from Yamna – when there is (yet?) not a single proof of it – may be just as troubling as the Indian case, or maybe more, since it affects an important part of Europe. I cannot believe that even today only western Europeans are capable of romanticising their own past no matter what, while the rest of the world lives in a quest to appropriate whatever they view as some great ancient culture, people, or language for their own ancestors. 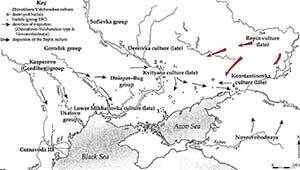 I have already received complaints and have seen people (of Y-DNA haplogroup R1a) complain online that their forefathers cannot have been Uralic speakers, and some Uralic speakers (of haplogroup N) that original Uralic speakers cannot have been of R1a lineages. Firstly, if I were eastern European – be it Germanic, Balto-Slavic, or Uralic speaker, or a speaker of Indo-Aryan languages, of R1a or N lineage, whatever my country of origin, I like to think I would prefer to know where my forefathers actually came from, and what languages they did in fact speak thousands of years ago, even if that disrupts everything I or my fellow countrymen (wrongly) assumed for a long time. Secondly, we – as western Europeans speaking Romance or Germanic languages – have the right to know exactly how our peoples and languages really came to be, even if that means disrupting others’ dreams. Our paternal ancestors probably changed languages 3 or 4 times during their multiple migrations from the east, and were not peaceful hunter-gatherers living since the Palaeolithic in the same region we do now, as traditionally held; if we can get over this, eastern Europeans and Indians can get over it, too. I think everyone deserves to know the truth, and they will eventually like it and fantasise with it. But many individuals want to disrupt any possible change to keep their current ethnic and nationalist agendas untouched, and that can affect us all. Nationalistic and romantic trends are understandable: Romans needed Virgil at the peak of their conquests to tell them that they had a glorious past in Troy, connecting them to the immortal Greek epics. The most important lesson one can learn from that example is that Italian researchers are still (2000 years later!) influenced by that myth, and they keep trying to look for Anatolian remains in Latin studies, and in the archaeology and evolutionary genetics of Italy. I guess you could therefore say these mythification trends are naturally human…but losing so much time in absurd quests for mythological identities seems absurd, and can only damage research.